I've heard so many awesome things about Sapori, that when I saw it was participating in Queens Restaurant Week, I just had to check it out. Vicky, Eric and of course Dan came along and we were all so impressed by this off-the-beaten-path eatery, that I genuinely can't wait for my next visit. Located in an industrial area, sort of in the middle of nowhere, it's hard to believe that Sapori exists where it does. I think it's the only restaurant on the block, and it's worth visiting. For starters, it has a cozy bar area in front with rustic walls, which are somewhat exposed with brick. There are a couple of high stools near the bar and even a table or two for small parties. Delving deeper into the restaurant, you'll find a dimply-lit comfortable setting, decked with warm colors, simple tables and chairs and impressive displays of cured meats, which are aged on the premises. In fact, during the day Sapori acts as an Italian food retail store--hence its industrial location. We were very satisfied with Sapori's generous restaurant week menu, which did a great job at showcasing their specialties featured on the regular menu. Portions were so hefty that we felt we got our money's worth--and then some. Although we each ordered our own dishes, we made a point of trying each other's food so we could sample it all. The most show-stopping appetizer hands-down was Eric's baby octopus. 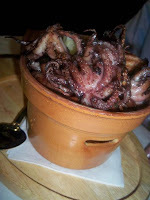 Served in a beautiful terra cotta dish (pictured above)--with a candle at the base to warm the olive oil and garlic that rested on the bottom--we enjoyed each fresh bite packed with not only the octopus but also borlotti beans, radicchio and caper berries. My second favorite dish was my asparagus budino, which resembled a baked custard, except instead of a sweet one, it was savory. Each bite was creamy and decadent, with a smoky finish from crispy bits of pancetta and fire roasted peppers. I've never had this kind of starter before and it made a big impression on me. Two other apps that we enjoyed included the carpaccio and cod fish crostini. Out of those, I preferred the carpaccio, which was generous on the meat (filet mignon) and even had shaved Alba truffles on top. The cod fish crostini was good too but I found the fish a bit bland--the flavors didn't pop as much as in the other appetizers. 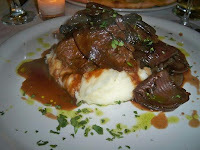 I'll start with my favorite, the costola corta, braised short ribs of beef, olive oil with balsamic scented red onions, resting on a fluffy bed of mashed potatoes. Wow! Not only did this dish look gorgeous, it was absolutely scrumptious and a perfect meal to have on a cold evening. The beef was slow-cooked, falling apart upon contact with my fork. But the best part were the sweet onions, which were sliced super wide. Pairing those with the hearty meat and the velvety potatoes created a perfect bite. Two other stand-outs were Dan's pizza al cornicione and Vicky's pollo della "rosticerria." 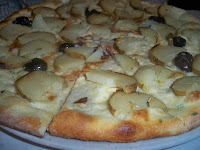 The pizza was a large pie, big enough for two hungry people, topped with soft, oven roasted potatoes, fresh rosemary and the sweetest red olives. My favorite aspect was the crunchy crust and the pungent truffle oil that was sprinkled on top. Vicky's pollo (chicken) seemed plain on the plate yet was anything but once you actually tasted it. Roasted to perfection, it had a beautifully golden crust and the juiciest interior I've ever tasted in a chicken. Paired with warm orange citrus sauce and sweet yellow beets, it was the lightest entree out of the bunch. Sapori's rich pasta offering wasn't ignored, as Eric ordered the pasta "a fourimano." It seemed to me like lasagna but the pasta dough was really special. I could taste the quality and freshness of the pasta as I chewed it, visions of Italian mamas rolling and kneading dough popping into my head. Layered with fresh, earthy spinach, ricotta so silky it made the corners of your mouth turn up and cherry tomato sauce that conjured up images of Italy, this dish couldn't be forgettable if it tried. Moved by the last two courses, we had high expectations for a sweet finish. When we found out that Sapori makes their own gelato, we knew that more goodness was in store. 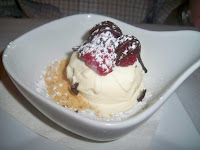 The gelato of the day was white chocolate and it was topped with homemade chocolate fudge and fresh raspberries. It was a simple yet refreshing dessert that was rich but not overly so. I found it a lot lighter on the stomach than a lot of buttery, creamy desserts like tiramisu or cake. Two other desserts we tried were the banana bruschetta and the panna cotta. Both were excellent, especially the banana bruschetta, which was glazed in a thin coat of crunchy caramel, sitting on a crusty piece of bread, smeared with my favorite hazelnut spread, Nutella. The panna cotta was light and creamy with a cappuccino base, which was different from the norm. Also drizzled with smooth raspberry sauce, it gave this dessert's gentle taste a tangy bite. Warm, friendly and helpful come to mind when thinking about the service at Sapori. The waiters are all Italian men (very old school) and they know their stuff. From pronouncing all the dishes perfectly, to recommending a good wine, these folks are at the top of their game. Costs were reasonable, especially since we participated in the Restaurant Week promotion. Each meal set us back $25 per person, however the overall check came out to about $42 per person with drinks, tax and tip. The beers were inexpensive but the wine was pricey, at $12 per glass. I 'd skip the wine next time and maybe go with beer. Regular menu items aren't too bank breaking either with most main dishes in the teens to low twenties. Ayuda for the Arts "Empowering the Creative Minds of the Future"
"A Fashionable Taste of New York "
Philanthropy- your time and donations for a great cause!